Today’s post is relatively brief. Blame it on a gorgeous Spring day in Michigan, or the need to focus on compelling activities and work duties. I do want to make sure that I give recognition to the amazing artistic talents of my wife, Nicole (go follow her on Twitter for gorgeous pictures from her art classroom). 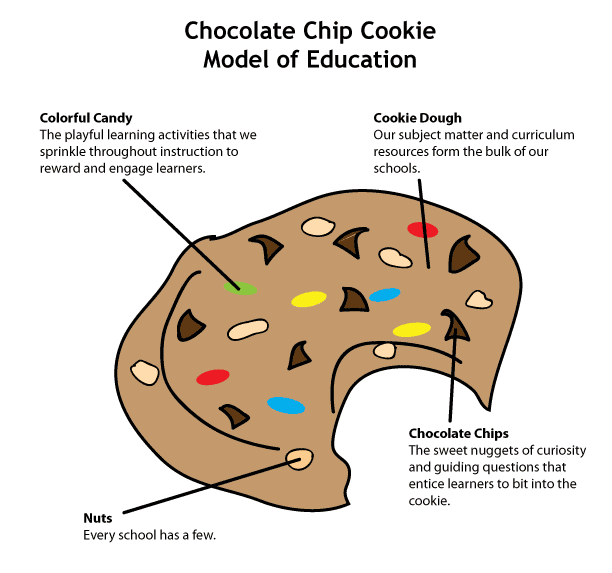 She has the Adobe Illustrator skills needed to bring the following “Chocolate Chip Cookie Model of Education” to life. Come to think of it, I think she pretty much came up with the entire concept, I just tweaked it a little. Sorry dear, you know I just have to meddle. Initially created on a whim with a quick sketch, I implored my wife to create something a bit more colorful to share for this reflection. With all the talk of SAMR, TPACK, and other models for helping educators conceptualize the need to integrate more technology within their instruction, I was struck with one thought headed into MACUL 2014. For every perspective and framework designed to help us better grasp important research and observational data, there are likely a large number of individuals for which these models further obfuscate the intended purpose. That’s not a bad thing; it’s just people approaching tools and frameworks from diverse backgrounds, and trying to make sense of it given their own experiences. If the SAMR model proves to be too linear for some, perhaps the TPACK model of balance might be a better fit. We’ve seen several riffs on Bloom’s Taxonomy, and adaptations of Maslow’s Hierarchy of Technology Needs, but I think the education world is severely lacking in the area of food as analogy for effective instructional settings. Please, take this post with the tongue and cheek it deserves, but feel free to riff on it yourself if you find it valuable. Next:14 Days of #macul14 – Day Six – I Found My iPad!